This is a composite image of Jupiter's volcanic moon Io and Europa taken during a March 2, 2007 flyby by NASA's New Horizons spacecraft. Here Io (top) steals the show with its beautiful display of volcanic activity. Three volcanic plumes are visible. 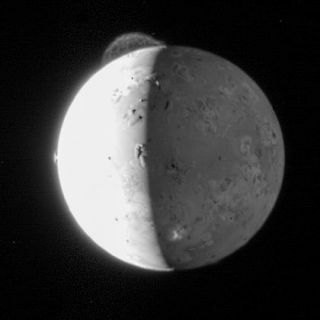 Most conspicuous is the enormous 300-kilometer (190-mile) high plume from the Tvashtar volcano at the 11 o'clock position on Io's disk. This is a map of the predicted heat flow at the surface of Io from different tidal heating models. Red areas are where more heat is expected at the surface while blue areas are where less heat is expected. Figure A shows the expected distribution of heat on Io's surface if tidal heating occurred primarily within the deep mantle, and figure B is the surface heat flow pattern expected if heating occurs primarily within the asthenosphere. The study was publised in January in the journal Earth and Planetary Science Letters.